Low on frills and high on quality. Open-back design is rare, but the soundstage on offer here makes a good case for a revival. We’re all for performance over frills, but the construction materials and presentation don’t convey $200. This article was published in the August 2015 issue of Maximum PC. For more trusted reviews and feature stories, subscribe here. Step into any recording studio and you’ll see a raft of Audio-Technica kit. Indeed, the Japanese firm is beyond proving itself in the pro audio sector. But it’s a different story in the PC enthusiast market. After an uncertain first outing in the form of its ATHAG1 gaming headset, A-T’s still in away game territory when it comes to gamers. That first-gen gaming headset had two major drawbacks: It was unreasonably expensive and it favored a paddle support system instead of the more comfortable headband. Everything else was pretty much on point. As you’d expect from such a prestigious brand, sound quality was precise, refused to distort at high volumes, and featured an impressive stereo spread range. 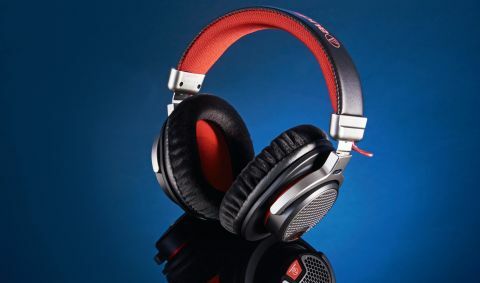 That’s an important preface to the arrival of these cans; a second generation of gaming audio priced below its predecessor, and featuring a traditional headband design. The PDG1 has a new sibling in A-T’s second-gen gaming headset range, the ATH-PG1, the latter offering a closed-cup design in contrast to this model’s “open air” dynamic drivers. What’s the difference? There’s no clear superior, both having their pros and cons. Open-back headphones let in more external noise and leak more of your audio out into the room, which means they’re not as good at producing powerful low-end than closed-back cups. However, they’re generally better at creating a wider soundstage, giving the impression that the audio’s coming from all around you. Closed-back cans tend to sound like the audio’s coming from inside your head. We generally prefer closed-back headsets. However, the ATH-PDG1 makes a very convincing case for itself. Stereo spread is, indeed, very impressive. We’re not talking about digital surround—these cans are getting no help from a soundcard or firmware layer to create cinematic Dolby whizzbangery. It’s all about how those 40mm drivers behave organically based on their engineering. As such, they’re capable of mighty impressive clarity and spread, easily equal to the first-gen ATH-AG1 in all aspects other than low-end oomph. They’re much more comfortable, too. At 225g, these are legit featherweight headphones that bear no disconcerting squeaks or creaks when adjusted to fit. You can even flip each earcup to face outward, DJ style, which proves useless in a gaming setting, but serves as a reminder of A-T’s prevalence beyond the gaming sector. We wouldn’t call the cushioning on the headband generous, but it doesn’t need to be when the unit’s so light. The only potential for discomfort is in the short distance between the padded contact point and the speaker surface of each earcup; leading to your ear pressing against the hard, flat speaker surface a little. We didn’t find this enough of an issue to force us to take a breather, though. Lessons have clearly been learned in the field of ergonomics, then. But pricing remains slightly problematic. These new cans are positioned at $200. And for that price, this is something of a no-frills package. No carry case, no swappable contact pads, no braided cable. The inline remote’s distinctly economy class, offering a slightly apologetic mic mute on/off switch and volume scroller. There is a smartphone cable, but that’s literally all she wrote when it comes to added extras. That creates a dilemma. The ATH-PDG1 does do the fundamentals exceptionally well. Even the mic’s worthy of mention for its adjustability and clarity. We’ve berated plenty of pricey headsets for their inclusion of meaningless distractions like customizable LEDs, so it’s great to see a product focusing on doing the important things well. However, it doesn’t do those things demonstrably better than other models—step forward Kingston’s HyperX Cloud and Cloud II. Nevertheless, it’s an encouraging step for A-T, placing its gaming products among the ranks of the best, just not quite at the apex.